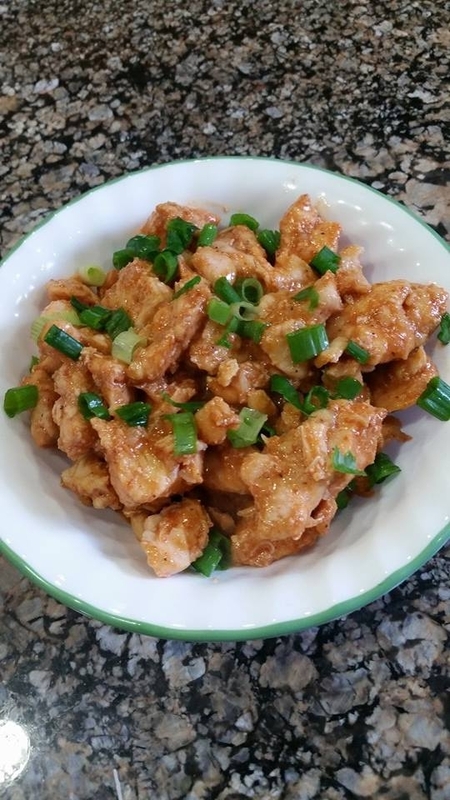 Cut the chicken breast into bite size pieces, season with salt, pepper, cayenne, paprika, garlic and onion powder. Cook the chicken breast in a slow cooker on half for 3 hours. Stir halfway through. In a small pan add all the sauces let it shimmer and reduce down for 5 mins. Add 1 TB of cornstarch with a little water and add to the sauce. Let the sauce cool down and thicken. Toss the cooked chicken with the sauce. Garnish with cilantro or green onions. Makes 12 servings, 1 Serving of 4oz cooked Chicken.